Anna junior quarterback Bart Bixler, right, makes a handoff to graduated running back Aidan Endsley in the first quarter of a Midwest Athletic Conference game against New Bremen on Sept. 15, 2017. Bixler played in extensively in three games last year when graduated QB Travis Meyer was injured. Sidney junior quarterback Ryan Dunham throws a pass during a scrimmage against Chaminade-Jullienne last Friday in Dayton. Dunham played in five games last year, including three when first-string QB Andre Gordon was injured. SIDNEY — Sidney junior quarterback Ryan Dunham has an easygoing personality — or “goofy,” as Sidney coach Adam Doenges describes. But even if he’s normally carefree, playing in front of packed stadiums several times in 2017 brought out the nerves. There will be many new players starting in skill positions when area football teams kick off the 2018 season on Friday night. Six of the eight area squads will start new quarterbacks, including Sidney and Anna. Sidney and Anna’s new quarterbacks aren’t without varsity experience, though, and Doenges and Anna coach Nick Marino hope that helps alleviate jitters from other first-year varsity players on Friday. Dunham played in five games last year, including extensively in three when starter Andre Gordon was dealing with a shoulder injury. Against Carroll, Xenia and West Carrollton, Dunham completed 9-of-30 passes for 151 yards and three touchdowns. He’s had a busy offseason, spending a good bit of his time in the weight room or practicing either formally or informally. His growth was on display in a scrimmage at Chaminade-Julienne last Thursday. In three quarters of play, he unofficially completed 10 of 14 passes for 262 yards and one touchdown. “I’ve been pleased with the progress he’s made, especially the last two weeks,” Doenges said. “We were a little worried a couple of weeks ago, but he’s stepped up the last couple of weeks, and we’re excited to see what he can do. Dunham has a ton of experienced receivers to choose from, including seniors Ratez Roberts, Caleb Harris, Josiah Hudgins and Keith Lee as wells as juniors Darren Taborn and Lathan Jones. He said the offense has learned a lot this preseason. 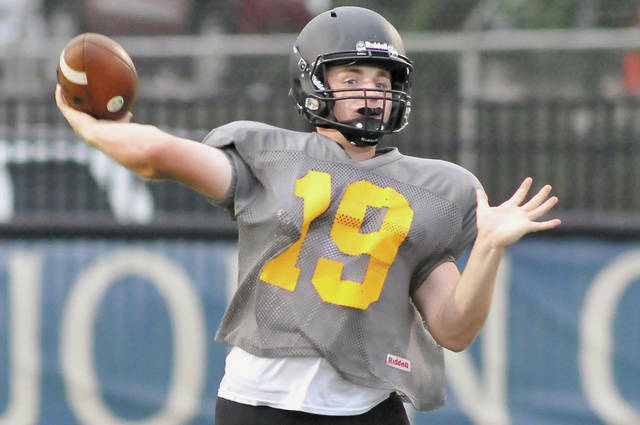 Anna junior quarterback Bart Bixler enters his first season as the team’s starter with similar experience as Dunham. He played extensively in three games last year when starting quarterback Travis Meyer dealt with an ACL injury. Marino said he’s looking forward to seeing Bixler excel this season, starting in Anna’s opener Friday at Middletown Fenwick. Doenges isn’t worried about Dunham in that aspect either when Sidney travels to St. Marys on Friday. The Yellow Jackets’ other young players? “You really never know if those guys are going to be ready until those lights come on,” Doenges said. “The CJ scrimmage was kind of run in game situation, but it’s completely different. There’s maybe 200 people there that night, there’s no band, it’s quiet. It’s completely different. This entry was tagged Adam Doenges, Anna, Bart Bixler, Football, high school, Nick Marino, Ryan Dunham, Sidney. Bookmark the permalink.